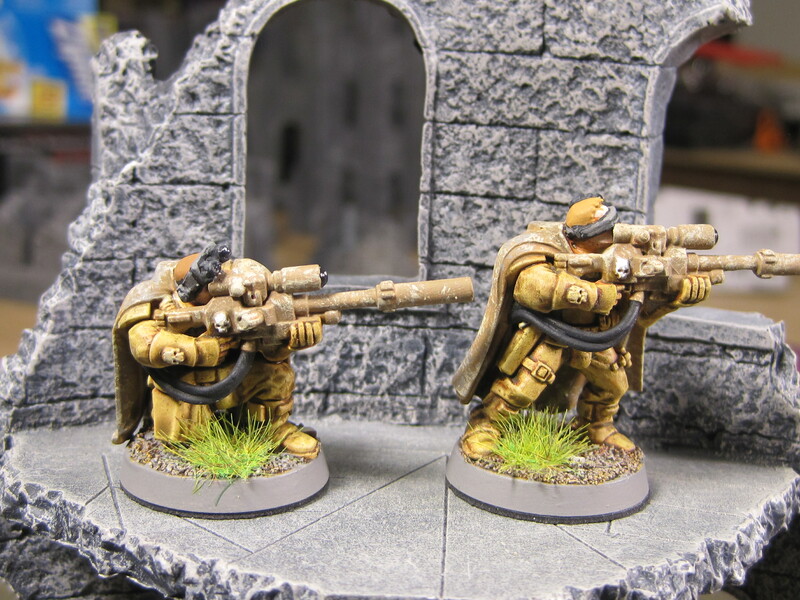 Pleased with how these turned out, I decided to go after a Space Marine scout team with sniper rifles. 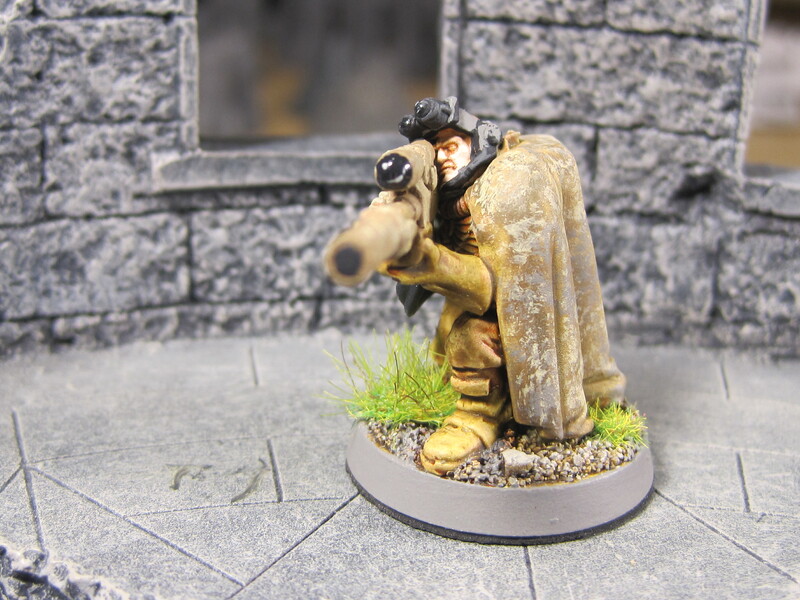 Devil Dog scouts with camo'd rifles and cloaks. 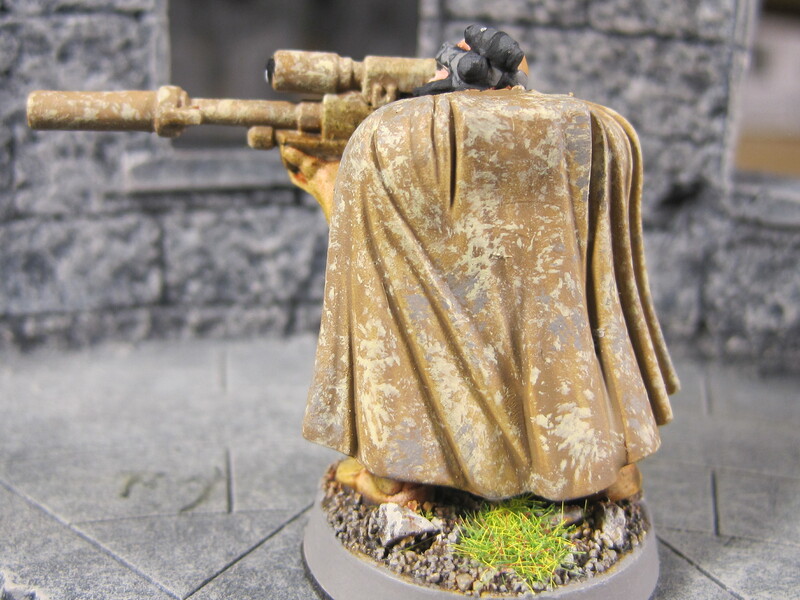 The base colors were Army Painter Skeleton Bone primer, washed with Vallejo Game Colours Flesh Shade, then highlighted back up with Skeletal Bone, with a final Sepia wash. Camo was done with a stippled pattern of Skeleton Bone and Gray. I have become a huge fan of the GW stipple brush. 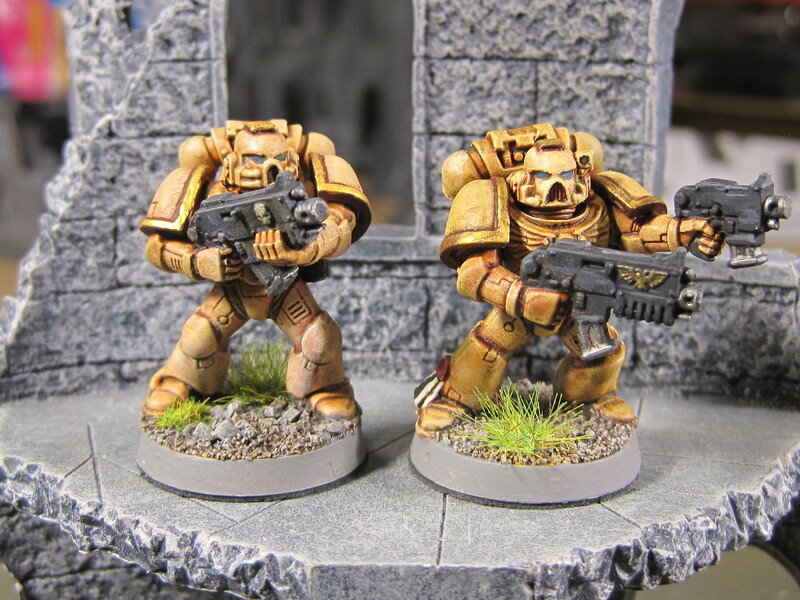 For the regular Space Marines, trim was applied with Crimson Red followed by Burnished Gold. 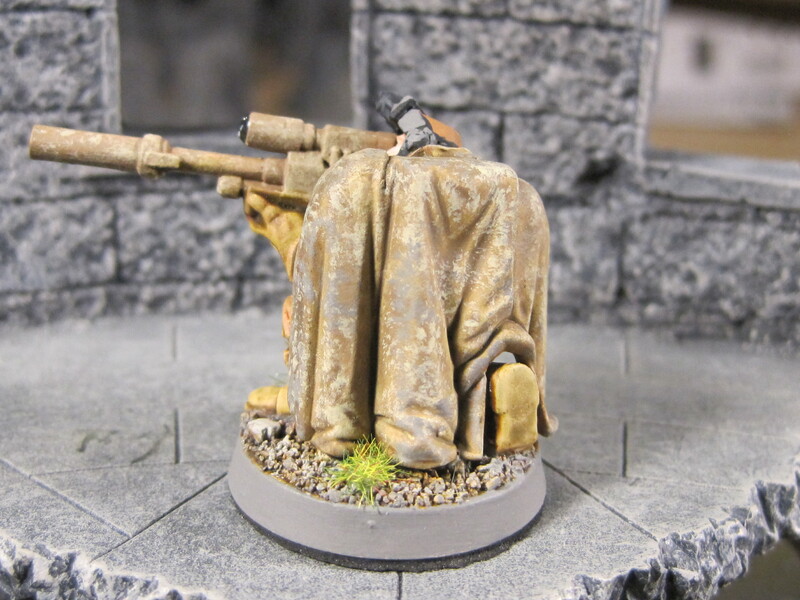 The bases were simply sand washed with sepia, then drybrushed with first Gray and then a Gray-White mix. I am very happy with the results and am busily finishing off about twenty more figures, including a Land Speeder and Ironclad Dreadnought in matching colors. The hand is back, baby! Surgery went well and I am in hand therapy to restore 100% motion to my left hand and index finger. The prognosis is excellent as five days after surgery I had almost 80% motion back in the finger, even with stitches in my palm. Hats off to Dr. Frank, my orthopedic surgeon! For those who absolutely need to know what happened, sometime in my younger years I damaged the pulley in my left hand and a year ago my left index finger started locking up…either straight out or in a trigger position. Several months of shots and examinations later, we finally settled on surgery. Until I get my stitches out and the ace bandage off my hand, my painting is curtailed. In the meantime, I am planning, writing and organizing. What’s being planned? Well, I am in charge of the Ambush Alley Gaming demo tables for Historicon which will be custom-built. I am not sharing the scenarios or boards at this time, but if you think Operation Enduring Freedom for one of them, you’ll be in the right neck of the woods. One board will be 20mm scale and one 15mm scale. All I can say is that I am itching to pull out the hot knife, the airbrush and to start making a mess all over my garage muahahaha. What am I writing? Well, I am writing the Cold War book for Ambush Alley Games. I am delving into declassified Soviet documents and trying to get a balanced perspective of what we all thought was happening versus what was really taking place. I just finished reading The Bear Went Over the Mountain, which is a collection of Soviet analyses of small unit actions during the Soviet-Afghanistan War that provides some deep insight into Soviet doctrine, tactics, adaptability and insurmountable issues. I am starting to take notes out of The Collapse of the Soviet Military that offers a picture of the Soviet armed forces during Gorbachev’s regime. I am also working on a couple of side projects for AAG as well, including Tomorrow’s War and helping redesign/build a new website for AAG. What am I organizing? For starters, my son Will and I are ripping up my collections and piles in the basement to try to restore some sense of order. Like most wargamers, I am a pack rat and I have been collecting things since I was in high school. If you want to take a stroll down the memory lane of the hobby, I could arrange a tour of my basement 🙂 I am also helping Will kick off a project with his friends that converts 40K figures and background into Tomorrow’s War stats. Unfortunately, this will be for our own personal use as I have no interest in seeing how hard the giant Games Workshop intellectual property attorneys can squish me. This project has also involved rapid assembly of some Space Marines, since I determined that they would be the quickest to paint for Will’s project. At first I considered painting these in digicam, but I have since come to my senses. I am cutting away much of the “Gothic” crap on the armor and vehicles and trying to go for more of an ultra-modern look and composition of the forces. I may end up in the desert uniform pattern for March 2003 US infantry which is much easier to paint.